After a long day at work, I often find myself in the kitchen creating something delicious to help relieve the stress. I can honestly say that it is not because I am wanting to make something to cure a sweet tooth, but, more-often, it is the organic process of creating something with my hands that can help alleviate my worries. Today was one of those days. My normal go-to on days like this are cakes, pies and cookies, but, today, I decided to make a hearty cinnamon raisin bread. 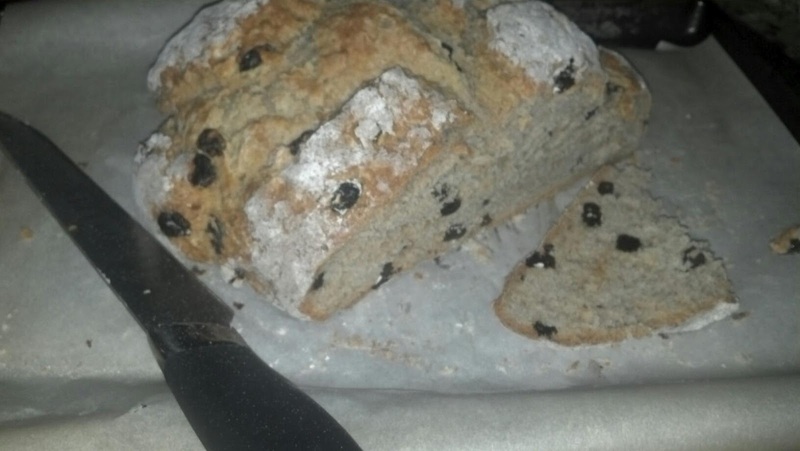 While watching one of my favorite cooking shows, I saw the recipe for Irish Soda Bread and immediately became inspired to blend the recipe with my love of raisin bread. The result? Delicious. This bread is great for a brunch or a breakfast treat, toasted crisp and spread with either butter or, dare I say, peanut butter! 1. In a mixer, blend together the dry ingredients. 2. After cubing the cold butter, add to the mixture until it looks like small peas. This ensures the butter is well distributed. 3. In a measuring cup, combine the buttermilk and egg. 4. Slowly add the liquid to the mixture with the mixer going. 5. When just combined, add the raisins to the mixer and mix long enough to just distribute. Note: The dough will be VERY sticky, but this is what you want. Do not over mix! 6. Turn the dough out onto a floured surface and kneed just enough to form into a ball. 7. Place the dough ball onto a baking sheet lined with parchment paper. 8. Slice a very shallow "X" into the top of the ball. 9. Bake for 45-55 minutes. The bread should be crisp on the outside and a toothpick should come out clean when tested. 10. Allow to cool and then slice. Adapted from the original recipe by Ina Garten on Food Network. So part of being a modern southern cook is about the ability to improvise. 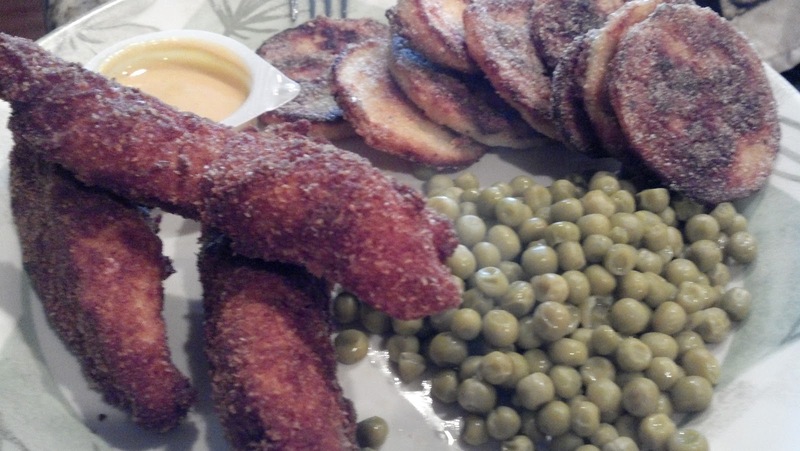 For example, last night my husband and I decided to make chicken tenders for dinner. Although I have a go-to recipe for tenders, I did not have the ingredients for the entire meal and I wanted to try something new. What I found turned out so juicy and crispy that I was AMAZED. The result is my new Crispy Chicken Tenders recipe. The breading stays attached to the chicken so well that I even sliced the meat and used on my salad the following day. I hope you love it too! 1. Preheat fryer to 350 degrees. 2. Cut chicken breasts into thick tenders. I was able to get 3-4 tenders per large breast. 3. Prepare your dredging station. 4. Run each tender through the dreding sequence to thoroughly coat. I suggest keeping 1 hand for dry containers and 1 for the egg mixture to prevent a massive clumping. 5. Lay each tender on a baking sheet and allow to remain untouched for about 5 minutes. This gives the binding time to set before frying. 6. Fry the tenders in the preheated oil for 4-6 minutes, depending on thickness. Serve with your favorite dipping sauce or on top of a salad. Note: If you want an even crisper crust, try mixing in 1/2 Cup Panko Bread Crumbs into Container 3.